Celebrating Mark Rothko’s approaching 115th birthday and his artistic legacy, which has shaped the development of art worldwide, Daugavpils Mark Rothko Art Centre, in cooperation with the Latvian Association of Art Educators, organised an internationally juried exhibition “100 in Latvian Art”. The first of its kind in Latvia, the event invited artists, irrespective of their artistic practices, to participate in a group exhibition, adding to a comprehensive parade of today’s art. More than 150 Latvian artists applied for the exhibition, and the jury selected the best from the pool. The panel of judges included internationally renowned artists: Inga Heamägi (Estonia), Lars Strandh (Norway), Şirin Koçak Özeskici (Turkey), Manuel Schroeder (Germany) and Michail Tsybulsky (Belarus). The juried exhibition features the work of the following artists: Laima Steika, Aiva Žūriņa, Inguna Liepa, Andris Ungurs, Zigurds Poļikovskis, Ieva Lapiņa – Strazdīte, Guna Millersone, Edmunds Tamovičs, Ineta Ķergalve, Inguna Krolle Irbe, Madara Gulbis, Alvīne Bautra, Signe Vanadziņa, Agnese Apsīte, Aldis Dobenbergs, Agris Sārs, Antra Ivdra, Eduards Mihelovičs, Ilze Griezāne, Māris Upzars, Madara Lazdiņa, Sigita Daugule, Inga Jurova, Andra Kurzemniece, Laine Kainaize, Erika Kumerova, Ilgvars Zalāns, Ineta Freidenfelde, Kalvis Zālītis, Ilze Smildziņa, Eva Rotčenkova, Liena Bondare, Silvija Brigita Meškone, Ansis Butnors, Vineta Kaulača, Sandra Strēle, Agnese Kurzemniece, Taya Bell, Andris Biezbārdis, Kristīne Guršpone, Anete Kalniņa, Rasa Jansone, Vija Stupāne, Anita Meldere, Agnija Ģērmane, Vēsma Ušpele, Līvija Brigita Pavlovska, Vika Štrauha, Irina Ošleja, Dita Lūse, Jānis Murovskis, Inese Lieckalniņa, Ieva Nagliņa, Anatolija Zelča, Andrejs Mihailovs (Aaran Mayar), Kate Seržāne, Harald Jegodzienski, Sandra Krastiņa, Justīne Lūce, Una Gura, Baiba Dzenīte, Kaspars Geiduks, Lilija Zeiļa, Sanri, Marta Ģibiete, Linda Kozule, Elīna Titāne, Inita Reimandova, Inese Līne, Pēteris Sidars, Ilona Šauša, Aivars Ušpelis, Ieva Prāne, Ingrīda Rutka, Annele Slišāne, Anda Munkevica, Olga Fišere, Ruta Bogustovas, Iveta Laure, Ingūna Levša, Inga Vasiļjeva, Dainis Gudovskis, Modris Svilāns, Jūlija Jereško un Rihards Vītols. Some artists were expressly invited by the curator to add to the exhibition: Džemma Skulme, Oskars Zvejsalnieks, Ieva Spalviņa, Jānis Spalviņš, Uldis Čamans, Kristaps Zariņš, Kristaps Ģelzis, Edvards Grūbe, Vija Celmiņa, Maija Tabaka, Silva Linarte, Agra Ritiņa, Vija Zariņa, Kaspars Zariņš, Jānis Andris Osis, Izabella Krolle, Gunārs Krolis, Aleksandra Šļahova, Eleonora Pastare, Lība Ločmele, Māris Grosbahs and Rolands Krutovs. The exhibition “100 in Latvian Art” showcases artwork by several generations of artists. It was conceived as a visual narrative with no borders or limitations, which would span the artistic scene of today and let the viewership meet several generations of Latvian artists at once, focusing on similarities and differences, things current and relevant, which, at different times, inspired artists to create in glass or ceramics, painting or textile. 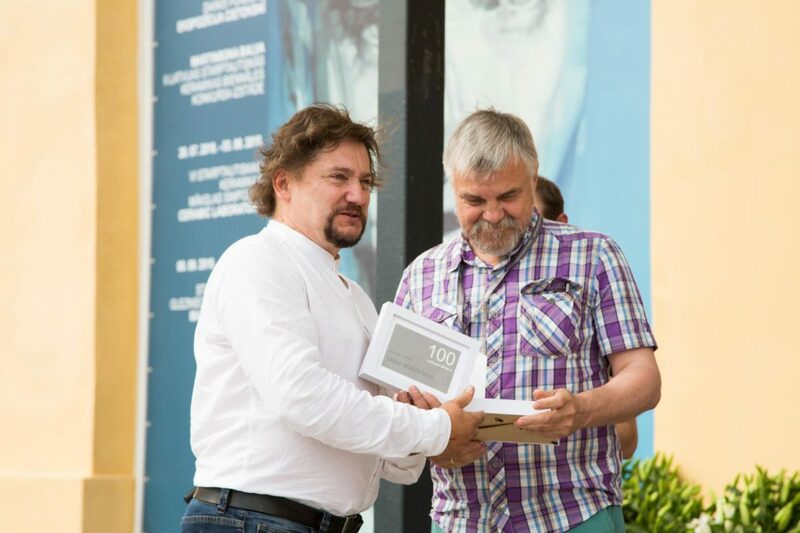 At the opening ceremony of the internationally juried exhibition “100 in Latvian Art”, winners received their awards. Two artists, Linda Kozule and Ieva Lapiņa Strazdīte, won an opportunity to participate at the 15th international painting symposium “Mark Rothko 2019”. Kaspars Geiduks won the rights to a solo exhibition at the Rothko Centre in the spring of 2020. Meanwhile, Anita Meldere and Jānis Murovskis earned honourable mentions from the jury. The exhibition is available at the Rothko Centre until 9 September.